Get an Emirates (EK) flight quotation from Johannesburg to your destination of choice. Emirates Airlines operates daily flights between Johannesburg and Dubai (UAE), and onwards to the rest of the world. Email us a review of your Emirates flight and we'll send you SouthAfrica.TO flight discount vouchers. 4 January 2013. Rating 5/5 After some torrid experiences, Annelise finds here travelling mojo again...thanks to an Emirates Johannesburg to London flight. 31 October 2011. Rating 4/5 : A long-haul flight in economy class is cramped and uncomfortable, no matter which airline you fly, which is why little details make all the difference. Our Emirates flight to Dubai was uneventful, but pleasant enough. I booked our tickets on the Emirates website—a quick and easy process. I do recommend that you print out your confirmation/itinerary email as soon as you receive it, because mine somehow got lost in the great dark hole of the internet. Luckily I had forwarded it to my husband before I lost it. Emirates allows 30 kg of baggage in Economy Class, 40 kg in Business Class, and 50 kg in First Class; quite a lot more generous than most airlines. They also allow one set of golf clubs and one pair of golf shoes at no additional charge (after all, Dubai has some world class golf courses). For other sports equipment, see their website for details. “Pets are not permitted in the cabin, with the exception of falcons between Dubai and certain destinations in Pakistan.” This was taken from the Emirates website which I thought might be of interest to passengers with an interest in falconry. Check-in closes 90 minutes before the flight is scheduled to take-off. If you suspect that you may get to the airport a bit late, you can check in online, open from 24 hours before your flight. You can then print out your e-boarding pass yourself, or collect it when you check in your bags. Our return flight from Dubai involved a self-service check-in. Being the developing world South Africans that we are, we were quite impressed by the shiny self-check-in machines… but then we still had to queue at an Emirates counter to weigh and check-in our bags. Being the developing world South Africans that we are, we didn’t really understand the point of self-service check-ins. I would recommend flying during the day, other wise you give yourself jetlag as a night of tossing and turning in limited space makes you want to sleep through your first day in Dubai. 11 May 2011 Emirates announced that as an enhancement of its 3-times daily flights between Johannesburg and Dubai from 1 Oct 2011 it would start flying an A380 aircraft on the route (the flight is currently in a Boeing 777-300ER). The announcement comes in the light of a 12% increase over the last year in the number of Emirates passengers flying from South Africa. Emirates has its A380 configured with 399 economy class seats, 14 first class suites and 76 business class seats. On the upper deck premium passengers can socialise in the lounge. Emirates Airline's President, Tim Clark, said: “We have enjoyed a successful partnership with South Africa since launching services in 1995, and now connect our Johannesburg, Cape Town and Durban gateways to our vast global network through 42 non-stop flights each week to Dubai. The very positive trends we have witnessed over the last 12 months will only be boosted by the arrival of our flagship A380 aircraft, which has set a new benchmark for air travel. Our A380 demonstrates the future of aviation - both in terms of passenger experience and environmental sensitivity," he added. "By launching the aircraft to Johannesburg, we are further underlining our commitment to serving South Africa and we anticipate very strong demand from leisure and business travelers keen to experience its unique features and unparalleled levels of comfort in the air.” Emirates flight EK762 leave Johannesburg daily at 14h10 (SA time) and arrives in Dubai at 00h10 (local), and flight EK 761 leaves Dubai daily at at 04h40s (local time) and arrives in Johannesburg at 1050hrs (local). From Dubai, passengers can connect to Europe, the USA, Asia and Australia. Passengers wishing to stop off in Dubai can visit the world's tallest building (the Burj Khalifa), enjoy indoor skiiing, desert safaris and the famous Wild Wadi waterworld. 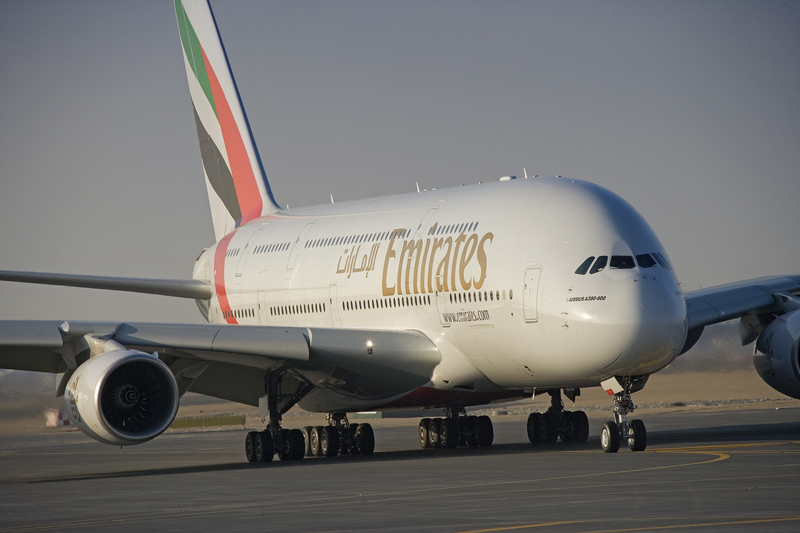 Emirates also flies double-daily flights from Cape Town to Dubai, and daily flights from Durban to Dubai. Alternative options are Qatar Airways, Egytpair, Etihad and Turkish Airways.